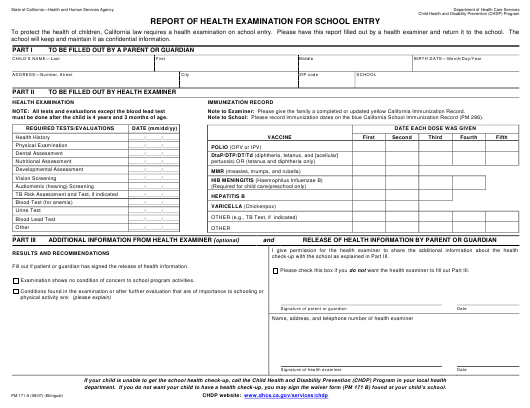 Form PM171 A or the "Report Of Health Examination For School Entry" is a form issued by the California Department of Health Care Services. Download a PDF version of the Form PM171 A down below or find it on the California Department of Health Care Services Forms website. school will keep and maintain it as confidential information. Note to Examiner: Please give the family a completed or updated yellow California Immunization Record. must be done after the child is 4 years and 3 months of age. Note to School: Please record immunization dates on the blue California School Immunization Record (PM 286). check-up with the school as explained in Part III. Fill out if patient or guardian has signed the release of health information. Please check this box if you do not want the health examiner to fill out Part III. Examination shows no condition of concern to school program activities. department. If you do not want your child to have a health check-up, you may sign the waiver form (PM 171 B) found at your child’s school. salud que llene este informe y entregelo a la escuela—este informe sera archivado por la escuela en forma confidencial. de 4 años y 3 meses. de este examen como es explicado en la Parte III. (distribuir) la información de salud de su niño/niña. Por favor marque esta caja si Ud. no desea que el examinador llene la Parte III. en su departamento de salud local. Si Ud. no desea que su niño(a) tenga un examen de salud, puede firmar la orden (PM 171 B), formulario que se consigue en la escuela de su niño(a).